Can you have a look at this plant in the ID Center? I think it may be also Syngonium macrophyllum. Subject: Re: [Aroid-l] Philodendron "SCH�NBRUNNER HYBRID"
I have a plant like this called Syngonium macrophyllum. I have a house plant that I would like to be identified, if possible. It is a climbing aroid and looks like the plant offered in the german ebay as Philodendron "SCH�NBRUNNER HYBRID". Its leaf venation does not look like that of a Philodendron. It has collective veins (at least I think so) like Anthuriums. However, it has no geniculum at the junction of the petiole and the leaf blade. The upper side of its leaves is slightly velvety. The upper side of the older leaves is dark green, the lower side is lighter green. The younger leaves are bicolorous with darker and lighter green areas as if it would have been sick, but it is not the case. As the leaves mature, the upper surface becomes uniformly dark green. The leaves are about as large as a man's hand (about 18 cm x 11 cm). It hasn't flowered for me, so I can't say anything about the inflorescence. I have taken some photos of it (attached). Is it simply an unknown hybrid? Or something else? Your plant looks a lot like one that I have that I got from the local university called “Syngonium chiapasense”. See the attached photo (resized smaller). It also bleeds white. However, I cannot find the name on TROPICOS or MOBOT or in any literature on the genus. I am very interested to learn the correct name of this very fast growing species. I will start researching S. macrophyllum. Subject: Re: [Aroid-l] Philodendron "SCHÖNBRUNNER HYBRID"
form of a Syngonium sp., possibly S. macrophyllum. 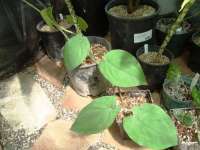 What's the difference between Syngonium macrophyllum and S. chiapasense (in juvenile plants)? Subject: Re: [Aroid-l]Philodendron "SCHÖNBRUNNER HYBRID"
Nie znaleziono wirusa w tej wiadomości przychodzącej. larger. At Kew S. chiapense got to 10 m before it flowered.